CONSIDERING YOUR MILITARY SERVICE, CONSIDER S.A.M.S. A few years of military service enabled some of us to gain a college education. For others, it was the start of a career. For many veterans their military service was their earliest opportunity to gain independence, responsibility, and leadership skills while serving their country. As Scots we wear the kilt instead of a military uniform to pay our respect and appreciation for what our Scottish ancestors endured, and to celebrate their traditions and culture. And there’s also a way kilt-wearing veterans can still honor the traditions of their military service. 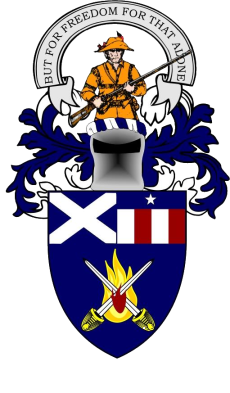 That’s by becoming a member of S.A.M.S., the Scottish-American Military Society! The Society was founded in 1981 as a non-profit veterans organization. The membership is composed primarily of veterans of Scottish ancestry who have served -- or are serving -- in the Armed Forces of the United States and the Commonwealth. Providing a fraternal atmosphere for members. Plus, S.A.M.S. is fun! We provide a Color Guard to local community events and parades, we greet returning troops from overseas, and we have an annual Dining Out in traditional military style. Our uniform is a service-type shirt which is worn with our kilts, and we have no ranks or rank insignia. We’re all alike in S.A.M.S., serving our community and honoring our military service and Scottish heritage. Membership is open to honorably discharged veterans or active duty or reserve military persons who have served or are serving with any branch of the United States or Commonwealth Armed Forces, including Coast Guard. If you support the purposes shown above and qualify, we welcome your membership! My military service began in the Navy ROTC at the University of Pennsylvania where I graduated in 1984 with a bachelor's degree in electrical engineering and my ensign's commission. My 12 year military service consisted of tours on three Submarines, the USS John Adams SSBN 620(B) the Lewis and Clark SSBN 644(G) and the USS Kentucky SSBN 737(G). I also served on two submarine squadron staffs, Squadron 18 in North Charleston, SC and Squadron 20 in Kings Bay, GA. I'm nuclear engineer qualified, qualified in submarines, and spent the majority of my Navy time in the nuclear weapons world either as a division officer or department head or as an inspector on squadron staff. I was a recipient of the "Peace Dividend" and invited by the Navy to find other things to do with my time in 1996. My civilian career has been spent in the SF Bay Area building communications satellites for the past twenty plus years and my goal is to retire from the same job in another dozen years or so. I have my MBA, and graduate level training in Program/Project management. I am also active in the Knights of Columbus where I have held many positions of increasing responsibility, and serve in their Color Corps to render honors at events and services. I am active in the Post Color Guard and after a whirlwind introduction to the SAMS post have attained the position of XO after four months as a member, where I currently serve. My hobbies include golfing very poorly and cooking very well, as well as marching around with swords and flags. My military service consisted of 10 years active and 14 years reserve duty as a Supply Office in the U.S. Navy. I retired as a Captain (O-6). My active duty stations included a Fleet Ballistic Missile Submarine, an Aircraft Carrier and several shore stations. I am qualified in submarines. My civilian career included positions in accounting, purchasing and facilities management. I have a Bachelors Degree in Accounting, a Masters Degree in Management and an MBA in Accounting. I am currently retired and keep active as a volunteer on the SS Jeremiah O’Brien, a WW II Liberty Ship home ported in San Francisco, CA. I am active in the Post Color Guard and served as XO, CO and am currently the Comptroller. Joined the Naval Reserve in November of 1955 while still in High School and attended Boot Camp at Bambridge, Md. during the summer of 1956. Immediately after graduating from High School in Schenectady, N.Y. he was assigned, as a radioman, to the Heavy Cruiser, USS Salem CA-139 which was home ported in Ville Franche, France, and served the Flagship of the Sixth Fleet. He remained, during the Cold War, in the Mediterranean Sea until early 1959 when the USS Salem returned to Norfolk, Va. for decommissioning. He was then assigned to the USS Tutuila, ARG-4 which was assigned to the Caribbean Sea with ports of call of Guantanamo Bay and Port-au-Prince, Haiti. In August of 1959, he left the active duty service to attend Michigan State University. After graduation he received a commission as an Ensign in the Naval Reserve and served briefly on the USS Twining, DD-540, a Fletcher Class destroyer serving on the West Coast during the time of the Russian Fishing Fleet being off the coast of Washington. He then served in the Naval Reserve as an Air Intelligence Officer at NAS Alameda until 1973. Fran joined the Naval Reserve while still in high school. Through additional training each summer, he advanced to Quartermaster Second Class by the time of his graduation at the University of Arizona. He went to OCS in Pensacola and received his Naval Flight Officer’s wings in Corpus Christi in 1969. He served two overseas tours, including Vietnam in P-3 Orion’s with Patrol Squadron 50. Upon returning to the Naval Reserve, he continued to fly for 11 years with Patrol Squadron 91. He later qualified as a Command and Control Watch Officer in the ASWOC Intelligence Community. His last operational assignment was Executive Officer of the Reserve Patrol Wing at Moffett Field. Fran qualified as Tactical Coordinator/Mission Commander, amassing some 3,000 hours flight time, including 300 hours during Market Time in Vietnam. He has qualified as both Navigator and TACCO in P-3 Alphas, P-3 Bravos, P-3 Bravo Mods, and P-3 Charlies. Fran retired with the rank of Commander in 1995. Fran was employed by the City of San Jose, CA as an Executive Manager in multiple departments and later the City of Concord, CA. He currently works as an Executive Management consultant to local governments with a nationwide company. Fran joined SAMS in the mid-1990’s , served two tours as Post 1921 Executive Officer, two tours as Post 1921 Post Commander, was appointed as West Regional Commander in 2004 and elected as a National Councilor in 2010.